Earlier this summer, aquarists Austin Brayton and Jackie Anderson camped on a remote island in Maine to assist with Project Puffin, an Audubon Society project designed to restore populations of these clownish little seabirds. Read Part 1 of the series here. In this post, we join Jackie on Matinicus Rock. 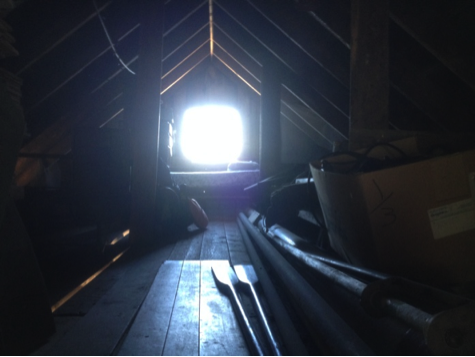 On my first day here I settled into my living quarters, which were in the attic of the boathouse. At first I was a little sad that my living space was away from everyone else’s, as they were sleeping in the lighthouse, but I soon found out that my new home for the next two weeks had a pretty awesome upside. In addition to being able to spread out a bit and dry clothes on a line in my own room, I could also look out the window located right next to my bunk and see an infinite number of stars at night and see more than a half dozen species of birds in the morning without even getting out of my sleeping bag! What a treat! Also, the guillemots love the boat ramp and I saw them chasing each other around every morning and heard them scurrying around on the roof above my head. Upon my arrival on the island, I brought my stuff into the boathouse and began to help ferry bags of gear and groceries up the boardwalk to the lighthouse. The lighthouse is situated right in the middle of the tern colony and there is a boardwalk going from the boathouse and the outhouse up to the lighthouse. Terns nest on either side of the boardwalk and see any sort of activity on the boardwalk as trespassing, and they take a very aggressive stand against it, cackling, screaming and dive-bombing. I even had them knock my sunglasses right off my head! After settling in here and unpacking my gear, our team started trapping and banding Arctic terns. 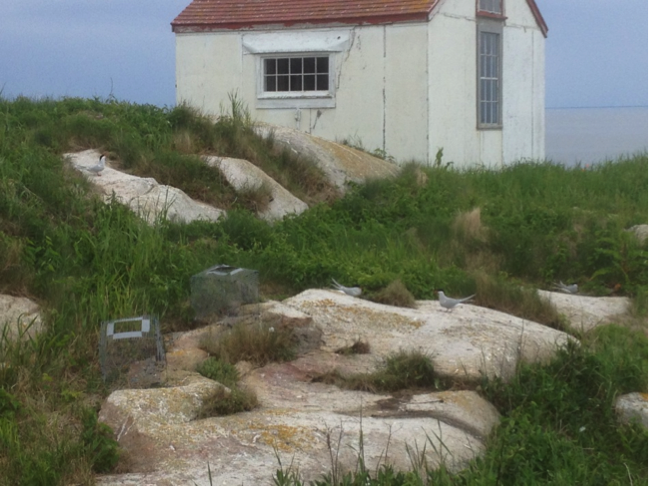 I was set up in a section of the tern colony with two treadle traps. These traps are basically large wire cages with an open bottom, a bird sized opening on the top, and a little trap door on the front. To capture birds, you replace their eggs with wooden eggs (so that they do not accidentally damage their eggs in the trap) and place the trap over their nest. Eventually they want to sit on their nest badly enough that they ignore the new wire thing over top of it and they walk inside. When they walk in, they pass over a ramp that trips the trap door and are trapped. Most of the time, they just calmly sit there on top of the fake eggs until you move. Then we gently remove them from the trap and weigh, measure and band them and return their real eggs. They go right back to their nests as if nothing had happened. We trapped terns for a few days, and like Austin, we had to stop on a few rainy mornings so that we didn’t scare them off of their nests when it was too wet and cold for the eggs.